These are some of my favorite tried-and-true products. I’ve been using these gems for years and just love them! There are so many protein shakes out there, how do you decide which one to try? My recommendation? That’s it. If you can read the label and not wonder what the heck something is, then chances are it’s a pretty good choice. I’ve done my fair share of research and the reason I recommend Shakeology is I drink it myself. It’s the only shake I’ve found that has the three things I need: it tastes good, gives me energy and it fills me up. Beachbody has both whey and vegan shakes. I like the vegan and have been drinking it for over five years. My favs? Vegan chocolate and vegan caffe latte (tastes like a coffee fribble!). 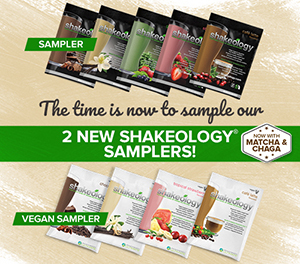 Shakeology is filled with with super foods, vitamins, minerals and high quality protein. Try a vegan sampler for less than $15 or their classic sampler for less than $20. It’s a symphony of good nutrition making sweet music in your mouth!